Timber Shutters – The benefits of having internal timber shutters fitted to your windows and French doors. 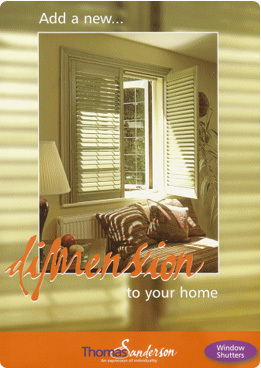 All shutters are individually made to your unique measurements and specification. An exclusive range of mouldings that are cut from high quality eco-friendly wood. The complete service – survey, design and fit. One additional major benefit of fitting Timber Shutters is Noise Reduction: People are increasingly fitting wood shutters, not just for decoration purposes but also for noise reduction, especially if their windows face busy roads. To summarise - Timber Shutters give you control of light, exceptional privacy, thermal insulation and noise reduction / soundproofing - while also decorating and adding value to your home. An unbeatable combination of benefits. Thomas Sanderson believe in offering quality wooden Window Shutters that will stay beautiful and functional for years to come. That’s why Thomas Sanderson offer a 5-year guarantee for your complete peace of mind.